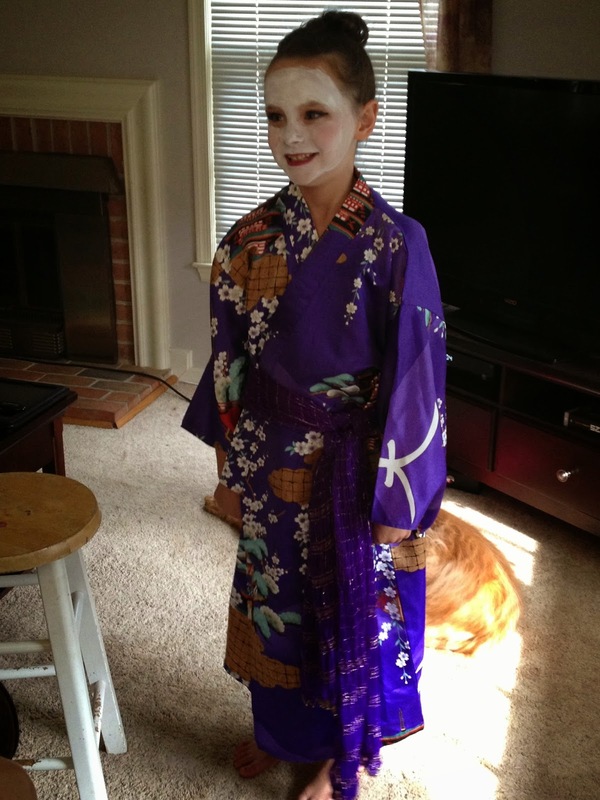 Granddaughter AnaSofia dressed for a costume party at her neighboring pool in Fairfax, Virginia. She went as the Disney character Mulan. After my conference in San Antonio finished, Sunday July 27th, I flew straight to Washington Dulles airport, rented a car (my usual routine) and joined friends and family for a week of non-stop activities. All four of my grandchildren were in town so that made everything more special. And our Family is expanding. Daughter Serena is engaged, and she and her fiance flew up from Texas so Jeff, my future son-in-law could meet the rest of our Crazy Family. Daughters Christine and Maria live in Northern Virginia, and daughter Melissa came down from Manhattan. We even planned two days of group activities, which were hilarious to watch play out. I told Jeff that getting our Family to do "group activities" was like herding cats. :) We're all Free Spirits plus all of us are. . . .how shall I say this? Outspoken. Verbal to the Max. And Independent, to say the least. But, no matter what we do, we ALWAYS have a great time. There's lots and lots of laughter and food, of course. Since Jeff and his family are native Texans, he and Serena decided to accept his aunt and uncle's offer to host a "Full Up" Texas Wedding at their large cattle ranch north of Austin. Dressy clothes for the ceremony, then switch to jeans and boots for real working ranch activies. I'm getting excited already just thinking about it. :) The wedding won't be until next Spring. Both Serena and Jeff are NASA people and trying to juggle all the demands on their time---conferences, plus Serena's astronaut activities----is difficult. What are your family gatherings like? Noisy? Quiet and sedate? Lots of Food? This sounds a lot like my family from years ago. I will never forget going on vacation with my sister and her husband along for the first time…we were asked to keep quiet and no wake my sister up until 11 a.m. (if I remember the time correctly) because it was her vacation too. Well, first we were shocked, and then we just ignored her and her morning crabbiness! LOL I think her husband couldn't believe we'd choose to be up so early and ready to go! You have a lovely family, Maggie!! And AnaSofia is absolutely gorgeous, what a lovely name. Our family events are filled with kids, food and fun! Your family is lovely. Great picture. I tried to figure out who was who. AnaSofia is really cute and I love the outfit. My family was very loud and we all talked at the same time but could follow any other conversation and add to it. My husband came from a quite family and never could get over our way of talking. I say it took talent. We had lots of parties and get togethers. Now my only son and daughter in law don't have many parties and her family can just sit and not say a word. I really do miss my family. I wonder what my d-i-l's family would have thought of my French, happy family. Our family gatherings are very loud and hectic with lots of food. My annual family parties include every relative who happens to be in the area. They're loud with lots of food. But the cool thing is, I have been able to introduce cousins to each other for the first time! Well, actually third cousins, but who's counting? Diane----I think noisy families are great fun. I was an only child & I always love the large family noise. Georgette-----Sounds like fun. And congratulations for introducing cousins to each other. That's great. Maggie, I was an only child too and I only had one.. Not by choice but that's the way it worked out. He has two young boys. I don't have much family (at least not family members that I see) except for my parents and my cats. AnaSofia is an unusual name. Did they name her after the actress AnnaSophia Robb? I'm an only child. I don't think I'd like noisy gatherings.